Battery issues are not uncommon while using an iPhone but this time, there is a weird issue discovered and complained by the users. 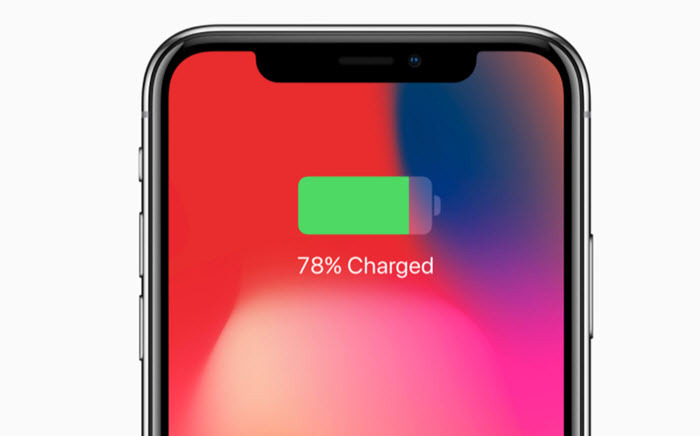 An abundance of users have found their iPhone's battery percentage gets stuck at some fixed number. This problem even occurs on iPhone X. For instance, after charging, the device works properly for a while and then all of a sudden the battery slows down and stuck at some fixed percentage. Actually, this battery issue is a software bug acknowledged by Apple and the company is determined to work on it by looking for a possible fix with the next iOS release. We expect this bug can be fixed in iOS 12. However, for the present, we have brought some potential solutions that can possibly help you out hen stuck with such situations. You can try them and get rid of the situation when iPhone battery percentage stuck at some point. When your iPhone battery percentage stuck at a particular figure and it doesn't buzz at all, you can try turning on and off the 'Set Automatically' option in Date & Time feature to fix the issue. Usually for iPhone 6S/6S Plus, manually altering the time zone when you travel is resulting in iPhone battery percentage stuck problem. So, how about a quick fix at our end, while Apple settles it with a new update? Connect your iPhone to a stable Wi-Fi network and browse 'Settings'. Go to 'General' and then 'Date & Time'. Now, toggle the 'Set Automatically' switch off and then on. Now, you need to force restart your iPhone. When your device is successfully restarted, you can see that the annoying battery stuck problem might have been resolved. The second solution when your iPhone battery percentage stuck is turning off and on the battery percentage. This process though fixes this weird problem temporarily; you need to toggle the indicator off and on. 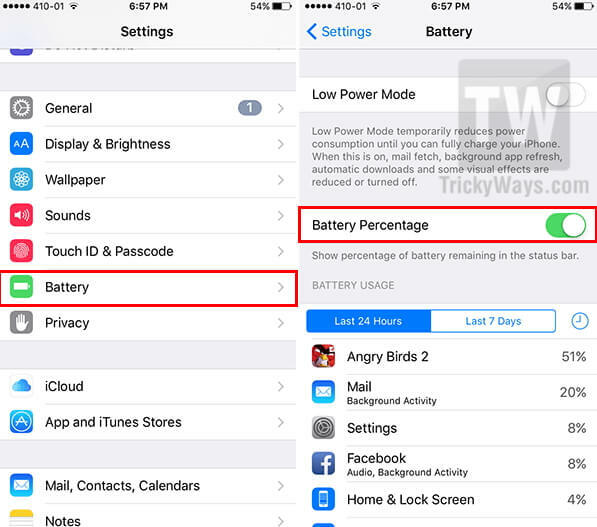 Here comes how to fix iPhone battery percentage stuck using this method. On your iPhone, go to 'Settings' and then scroll down a bit to select the 'Battery' tab. Now, the next screen will load all the battery related settings. You are then required to look for 'Battery Percentage' toggle switch to turn it 'OFF', wait for a few seconds and then back to 'ON'. If it was 'OFF' already then simply toggle it 'ON'. Quit 'Settings' now and reboot your device normally. 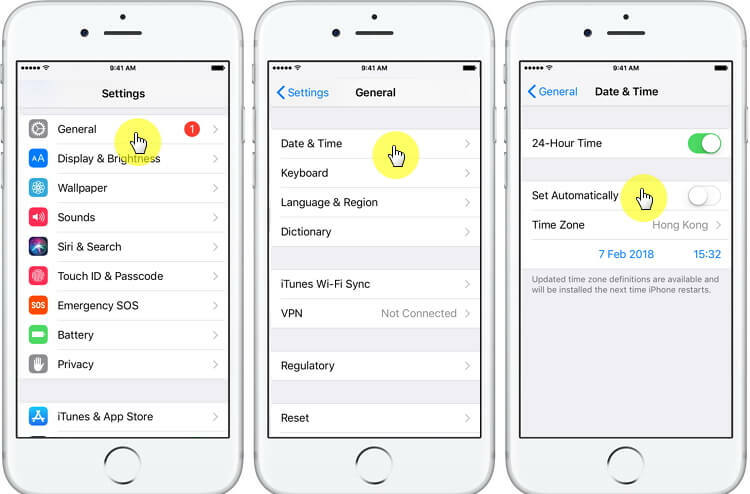 Now, your iPhone battery percentage stuck trouble might get resolved. The above mentioned processes may fix this troublesome situation temporarily and show the battery indicator properly. But, if the issue is related to iOS update, then you might need to wait until the next update comes and this bug is taken care of. Most of the times, various iPhone and iOS issues get resolved by restoring iPhone with iTunes. Though, the process results in complete data loss from the device. In this section, we will try fixing iPhone battery percentage stuck problem by restoring device with iTunes. Launch iTunes on your pre-trusted computer. Get a lightning cable and connect your iPhone to the computer. Follow the onscreen instructions if prompted for trusting the computer. Tap on your iPhone (device icon at the top) in iTunes interface and hit 'Summary'. Click on 'Restore iPhone…' and confirm by tapping 'Restore'. Once the iPhone has been restored to its factory settings, possibly the iPhone battery percentage stuck issue gets resolved. After restoring your iPhone, we recommend that you don't restore all the data back to your iPhone in case some apps are causing iPhone battery percentage stuck. However iTunes and iCloud cannot do that. Therefore, we are offering you a tip here. You can use iMyFone iTransor – a skilled tool designed to selectively backup and restore your iPhone. Using this tool will be a viable option for you since you get the flexibility to backup the data as per your choice instead of all the data on your device. 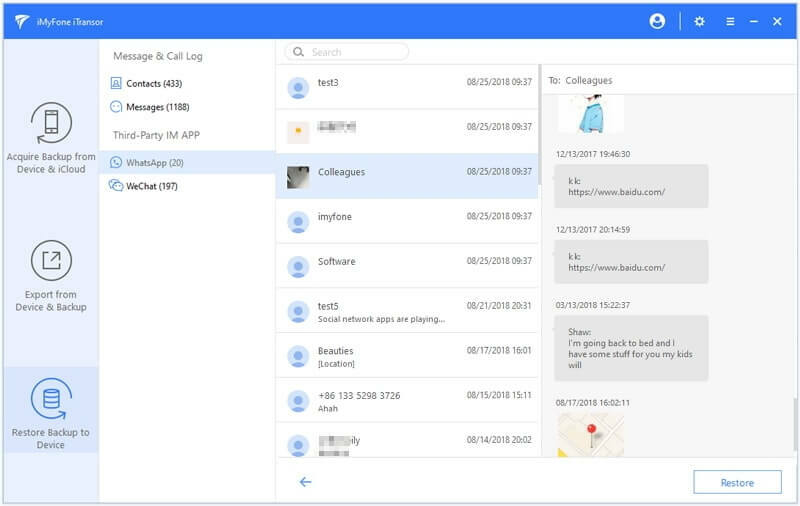 You can also use this program to restore certain apps such as contacts, messages, WhatsApp, WeChat from iCloud or iTunes backup to your device. Here is a step by step guide on how to use iMyFone iTransor to selectively restore data from iTunes backup. Step 1 – Download iMyFone iTransor. Install it and launch it on your computer. Now, select 'Restore Backup to Device' from the left panel of iTransor interface. Then from the backup list, choose an iTunes backup that you want to restore apps to your iPhone, and click 'Next'. 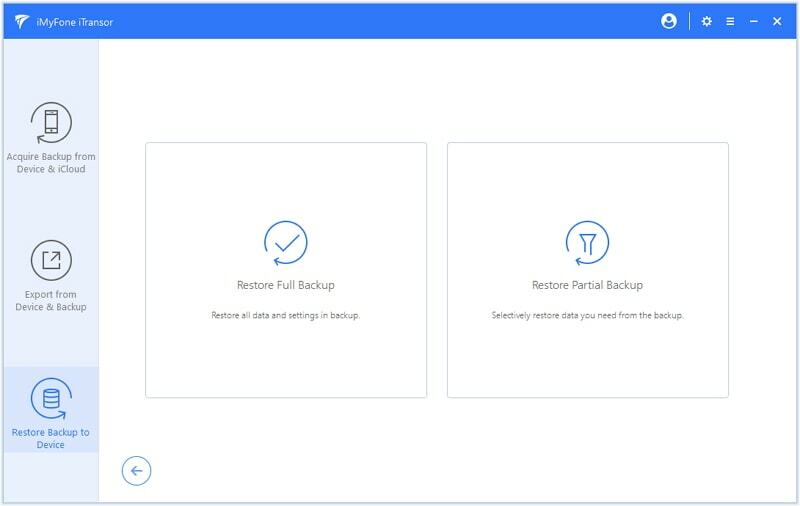 Step 2 – From the 2 options on screen, choose 'Restore Partial Backup'. Now you can choose the apps you want to restore. Before restoring, you have 2 options 'Preview & Restore' and 'Directly Restore'. Step 3 – If you choose 'Preview & Restore', you can preview the data details before restoring. If you choose 'Directly Restore', it will go directly to the next step. Step 4 – This is the final step. 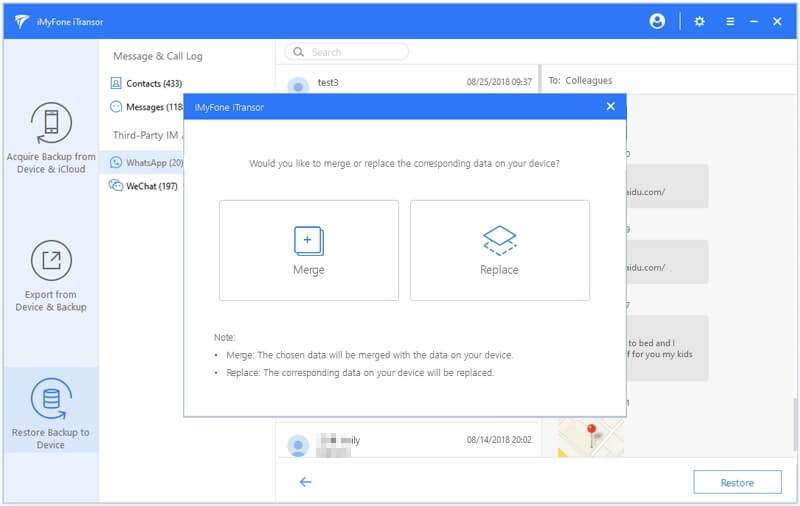 You can choose to Merge the data in your backup with the data on your device, or just Replace the current data. 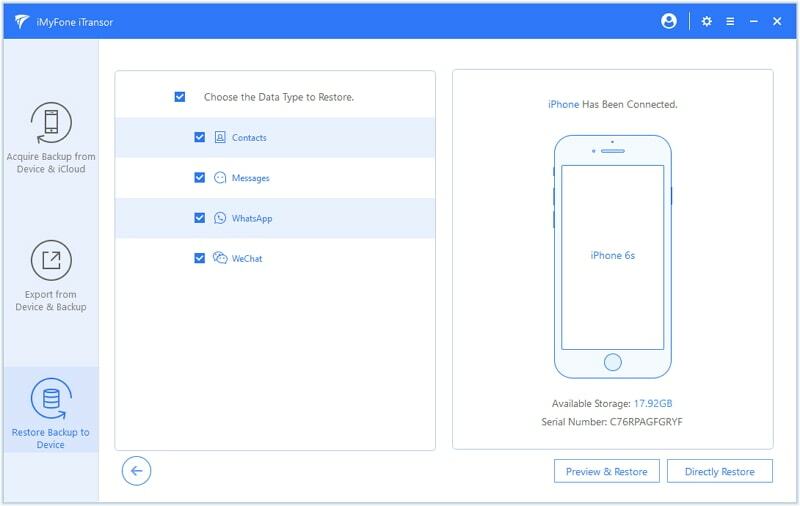 Since you have just restored your iPhone, you can now just choose Replace to restore the data to your iPhone. It will take a short while to finish the restore process.